The lifestyle guru takes us into the kitchen with Ricky Rozay—turns out, he's really about that pears-and-lobster-for-breakfast life. 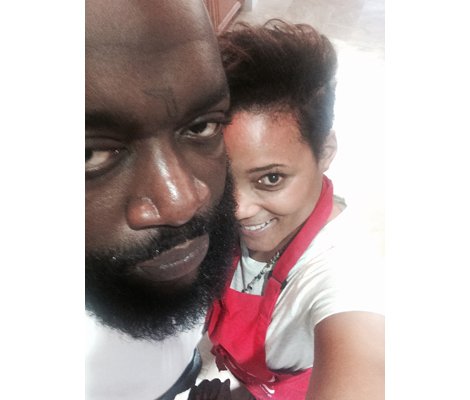 When Rick Ross’ personal chef Amaris Jones called me a couple weeks ago, she was attending the 11th annual Irie Weekend, an event hosted by the Miami Heat’s in-stadium DJ, DJ Irie. This prompts us to briefly chat about the Heat, which inevitably leads to discussion about the team’s star players, Dwayne Wade and Chris Bosh. Eventually, our conversation turns to former Heat star LeBron James and Jone’s now-shuttered soul-food restaurant South Street in Miami’s Design District. “It was a great concept and you had such a mixed crowd: You saw anyone from LeBron to Martha Stewart walking into that space,” Jones says. She drops this fact casually, as if A-list celebrities popping into your restaurant is as normal as cracking eggs in the morning. But for Jones, it really is. A Philadelphia native, she’s been a culinary and lifestyle-management presence in South Florida circles for over 14 years. She linked up with Ross more recently. Reebok approached her help the MMG head honcho—long known for celebrating excess with lyrics like “Wingstop, fat boy need a 10 piece”—develop a healthier diet to pair with his CrossFit training program. Since then, she’s helped Rozay drop more than 80 pounds and swap cheese-smothered Honey Buns for items like beets and pears—especially pears. We wanted to pick the brain of the woman who fuels one of hip-hop’s most well-known gourmands, and find out what it’s actually like to cook for the biggest boss of them all. From discussing how she turned Ross onto the wonders of cauliflower, to disclosing his go-to cheat-day meal, Jones provides a rare look into the culinary world of Rozay. For more insight into life cooking for a bawse, head over to our Instagram, @firstwefeast, where Jones will be dropping some exclusive photos of some of Ross’ favorite dishes throughout the day. How’d you get into cooking in the first place? I moved to South Florida over 14 years ago and, at the time, I was a regional property manager for a big real-estate investment trust company. Eventually, the company folded, but I stayed in South Florida. They would come over to my house for Sunday dinner and that’s what caused me to open a restaurant—to fill a gap. It was called South Street and it was in the Design District. I closed it about two years ago, and that’s what really what prompted me to do this full-time. Since then, I started catering all types of events, and instead of placing chefs, I would just do it myself. And that’s pretty much what prompted me to go full-force into the culinary world. Ross would travel overseas and he really loved that pears are great in places like Asia and Argentina—really soft pears. So, what’s it like working for Mr. MMG himself? I normally get calls very early in the morning from Ross, like around 5:30 or 6am—these are the times that I look at my clock and think, “He’s going to call me within 45 minutes.” Always I’ll have fresh fruit ready, including pears ready for him to snack on prior to his work-outs. He will gather his team and they all do an extensive workout for about an hour and a half. Afterwards, I hand him his fresh beet juice, or a mango or peach-and-mint juice for him to sip on and rest. He normally eats a half hour after his workouts. For that, I normally prepare a massive breakfast that will accommodate Ross and his entire team, which is set out and ready by 9:30am, and then I’ll prep five additional protein-packed meals for Ross to eat throughout the day. Have you ever seen him eat a bowl of lobster bisque for breakfast? No. But I have given him lobster bisque. And I have given him lobster for breakfast with a variety of protein that includes organic eggs, grilled chicken, and lamb chops. Speaking of his working out, what’s the story behind this picture (above)? If you look on his Instagram, people who are trying to get into shape are hashtagging “#RossFit.” It’s really funny. They built this whole RossFit facility behind his house and they’re out there training him every day, while I’m in the kitchen cooking. What would the #RossFit regimen even look like? Honestly, I don’t know. You’d have to ask his trainer. I know he does push-ups, runs, and all sorts of things to stay in shape. He goes to Wingstop pretty often and loads up on protein with their chicken wings—a ten-piece, to be exact. I can only imagine what that would entail. 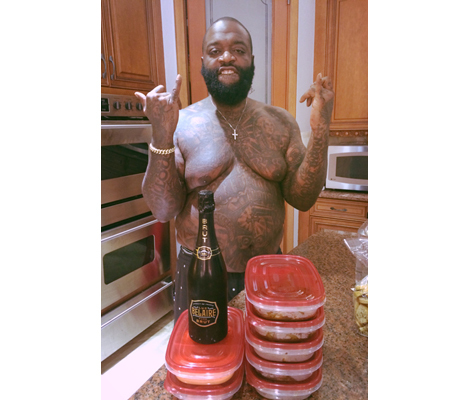 I’d envision there’s a bottle of Belaire in the background, too. [Laughs] Definitely with the Belaire! Obviously, we wanted to know how often Rick eats pears. Did you feel more compelled to serve them to him after the whole pear thing went viral last year? That’s pretty funny. But he’s always been a fan. I think he eats pears almost every day. Pears are his fruit of choice, so I just incorporate them into his smoothies, parfaits or make a chutney with them. So he didn’t just develop the love after the “shout out to all the pear” meme kicked off? He never was the guy that ate a lot of fruit in the past, but if he did it would be a pear. And he would travel overseas and he really loved that pears are great in places like Asia and Argentina—really soft pears. And I think he was in Dubai or somewhere and he tasted a pear over there and he said, “Oh my God, this is the softest pear I’ve ever had in my entire life.” It’s just a favorite thing of his. What are some of his guilty pleasures for Cheat Day? 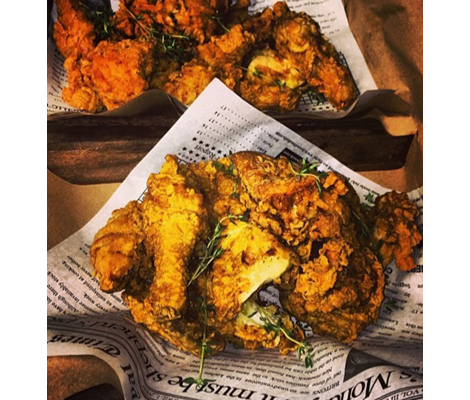 A typical cheat day would be fried food, so my free-range fried chicken. I use my secret recipe where I fry it in grape-seed oil, and then I use a top-quality flour and add the spices and a turmeric base. I serve it with a honey-sriracha sauce and a Dijon-mustard sauce and add a sweet-potato biscuit on the side. But he doesn’t have many cheat days. He’s been very good at being aware of his food choices. He goes to Wingstop pretty often and loads up on protein with their chicken wings—a ten-piece, to be exact. Does he also get into the kitchen and cook? I don’t know. I haven’t seen him cook. He’s so in love with my cooking in the kitchen he jokes with me and he tells me he can cook, but I’ve never seen it. He doesn’t like kale—that he won’t touch. Do you remember how you changed Ross’ mind on healthy food? But is there anything healthy he really doesn’t like? But I introduced him to baked cauliflower. He was never big on cauliflower, so the first time I gave it to him, I mashed it. I mashed the cauliflower and I served it on short rib. I put it in front of him. He started to eat without me telling him what it was. He tasted it and he said, “These are mashed potatoes?” And I said, “No, it’s cauliflower!” And he said, “What?” And then he said, “You know what? I like it!” Now that I know he likes it, I make cauliflower casserole and all types of other things. He loves it so much, it’s to a point where he’s requesting it. It’s just awesome. Yeah, it is awesome. It’s the highest compliment, that you’ve not only changed his mind on certain foods, but he’s now requesting them.